Square Enix started out with plenty of positives when it decided to put together Final Fantasy: All The Bravest. One of the most popular video game franchises was going to get a title tailor made for one of the most accessible gaming platforms around. Best yet, the game consists specifically of the most memorable moments and epic battles in Final Fantasy history. It’s even got gorgeous pixel art that feels right at home on iOS and captures the nostalgic feeling of plugging a SNES cartridge in and firing up a game. All the Bravest carries a $4 price tag, a pretty accessible entry price into a series that usually sells for $60 on it traditional console home. Don’t worry, though, because this game will give you the chance to pay almost every penny of that console price for absolutely none of the fun. Fans of Final Fantasy found themselves drawn to the game thanks to an innovative combat system and party management options. Wanting to give All the Bravest a distinct feel that would make it right at home on iOS, Square Enix stripped out the standard means of operation and simplified everything in a way that is way more tap heavy. That would be fine, except it essentially removes anything one would consider “game-like” from the game. It also strips the series of the formula that made it popular in the first place, which seems like a bad call this far into its existence. Your party can consist of an upwards of 40 characters. You will have no control over who they are, the formation they take or attacks they perform. You simply tap on them and they perform a default action. Once you tap to attack, the character will take a few second to recharge before you can use them again. No problem, as you’ll have plenty of other characters to tap in the meantime. That’s how you’ll have to occupy yourself in battle, because that is literally the only thing you have control over. Sometimes you will reach a Fever mode, available only once every three hours. This takes the recharge time out of the picture completely, so you can tap totally at will. It vaguely resembles something that is fun, but don’t be fooled by it. It’s really not. Sometimes, over the course of your battles, you will face an enemy who is too powerful to be defeated by your current party. Fear not, as Square has a solution for you. Use the handy party renewal hourglass in the upper right and you’ll get a refresh of your original group. You’ll get a couple free to start the game, though the tutorial forces you to use one and you will stumble into a battle that will essentially be too hard to overcome without a renewal in under an hour of gameplay. If things are too challenging after that point, you’ll either have to wait for members of your party to respawn at a rate of one every three minutes (remember, your party can be as big as 40 characters deep) or fork over a buck to bring everyone back at once. Feel like spending a bit more money? 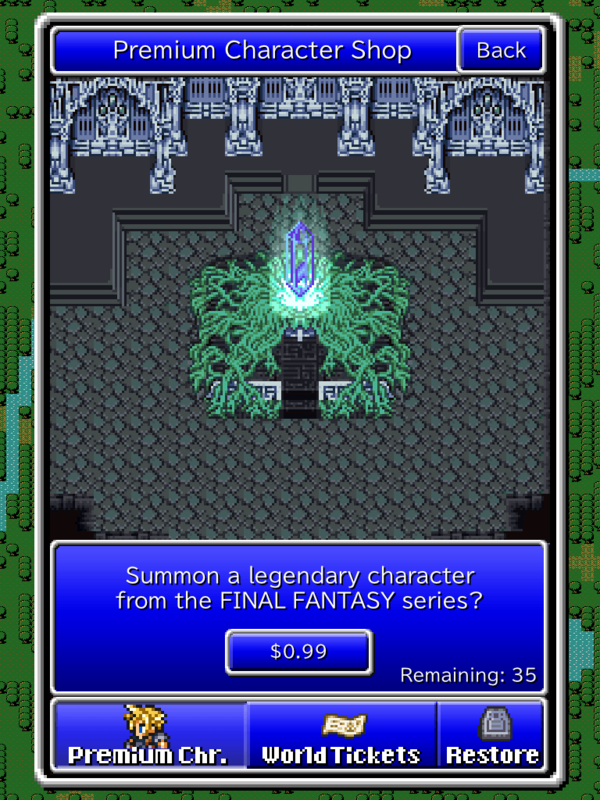 We hope so, because Square Enix appears to be hard up for cash given the in-app purchases in All the Bravest. Aside from the characters you unlock over the course of your gameplay, there are also a list of premium characters to be acquired. This isn’t done by skill or dedication or even just by dropping some cash. No, these 35 extra characters, the big names from the FF universe that are no doubt the reason you’re playing this baren excuse for a game in the first place, can be yours for a $1 a pop – but they are delivered totally at random. Get one that you don’t particularly like? Too bad, they are defaulted to one of your party slots anyway. This game is supposed to be all about nostalgia, of course, so you’re going to want to take those beloved stars of previous FF games and drag them through a re-imagined version your favorite moments in the series’ history. You can unlock the worlds of Final Fantasy VII, X, and XIII for $4 a pop, or the same price you paid just to download this travesty in the first place. 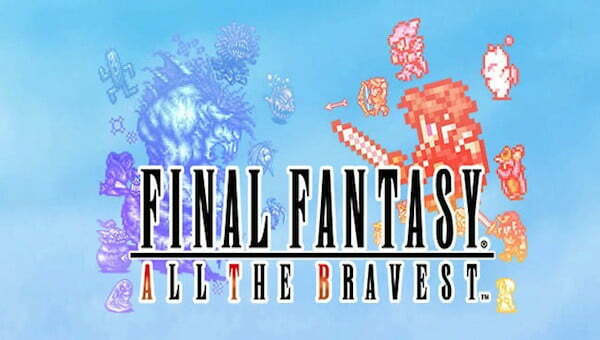 If you’d like to experience everything that Final Fantasy: All the Bravest has to offer, you will fork over at least $51. $4 for the download, $35 to unlock every character, then $12 to get yourself all the moments the game promised you’d be able to relive in the first place. That doesn’t account for the possibility you’ll have to revive your party for a $1. There doesn’t have to be anything wrong with in-app purchases. There is something very wrong with what’s happening here. We can’t imagine that people who want to relive their favorite Final Fantasy memories, people who have already invested a fair amount of their money into this franchise in previous installments, have any interest in forking over $50+ to play a totally stripped down, tappable movie version of the game they love. You want to have this same experience for far less money and get about the same amount of enjoyment out of it? 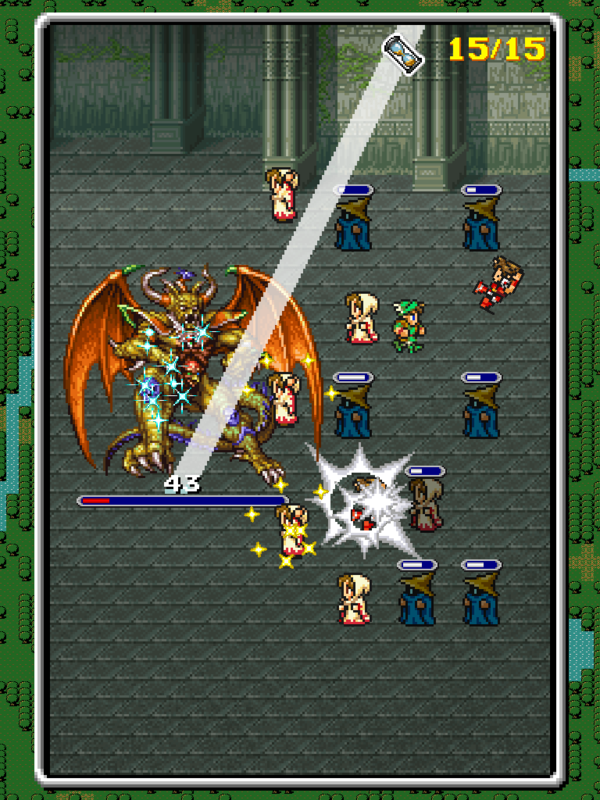 Load up the trailer for Final Fantasy: All the Bravest on YouTube and tap the screen occasionally as it plays. The video is a minute and twenty-seven seconds long, which is about how long you’ll enjoy this game.